That's a long title, isn't it?! But then, I have so much to say! First off, I made it through the first cut of the FoodBuzz Project Food Blog 2010. YAY!! Thanks so much to everyone who voted and for all the lovely comments on my last challenge post and retweets! It's now time to show my cooking skills for the 2nd challenge. For the second challenge, we were asked to pick an ethnic classic that is outside your comfort zone or are not as familiar with. You should include how you arrived at this decision in your post. Do your research then try to pull off successfully creating this challenge. Try to keep the dish as authentic as the real deal, and document your experience through a compelling post. 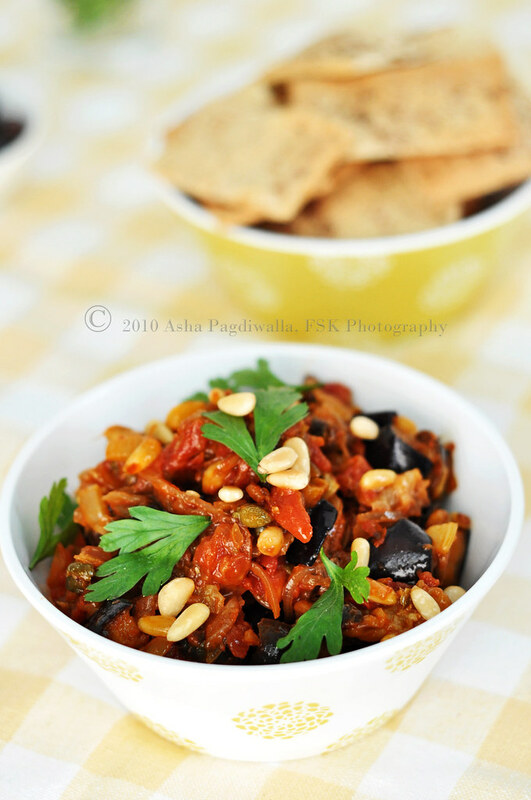 Coincidentally, the dish of choice for this month's Velveteers challenge was the Sicilian Caponata. As I was mulling over what to make for the PFB, a light went on in my subconscious. I think it happened in my sleep (That happens often. I tend to think through things with amazing clarity, moments before I doze off!). Anyway, I woke up two days back thinking this would be the perfect dish to recreate for this challenge, for many reasons. First of all, and I am rather pained to admit it, even though Italian cuisine offers me a comfort fix second only to Indian food, I have not ventured to cook much beyond pastas and risottos at home. So, Alessio's suggestion of the Caponata was not only timely but also inspiring! Second, as I read more about the dish, I learnt it actually has Arabic origins. That only intrigued me further. What's more?! When I read through the recipe, I realised, with almost a jolt, so many similarities with the Parsi style of cooking (my in-laws)! The balance of sweet and sour achieved using sugar and vinegar is exactly the same principle and method followed in Parsi cuisine. Not surprising, after all, given their Persian roots. Delving further, the eggplant in caponata is traditionally fried. My MIL does exactly that with her veggies when she makes her sweet and sour stew! I was hooked, line, sinker and bait! Little had I known, when I ventured near Sicily, that I would unearth more in common than an leaning towards good flavor! 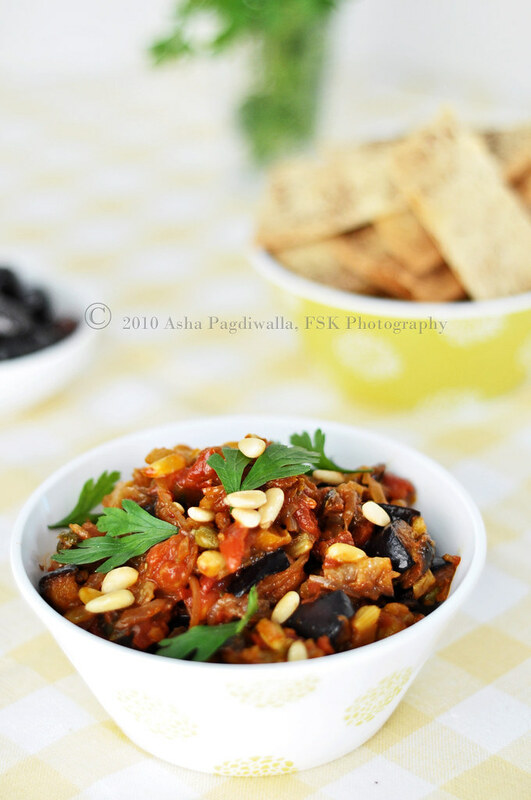 The Caponata pays such a beautiful tribute to the freshness of each ingredient. The dish preserves each component in its simplistic form uncluttered by spices and yet delivers such a depth of flavor that is amazingly refreshing! Caponata is traditionally served on crostinis. I wanted to put my spin on this. Since the dish itself is soft textured, a pairing with something crunchy made sense. I decided to go with homemade crackers. 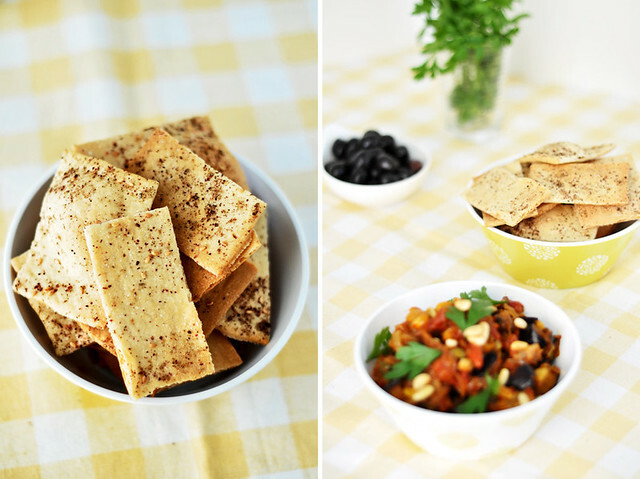 For one, I haven't made them before and I just liked the idea of spooning the caponata with thin slices of crackers. For the flavor, I went along with the Mediterranean theme and used Z'atar to spice them up. 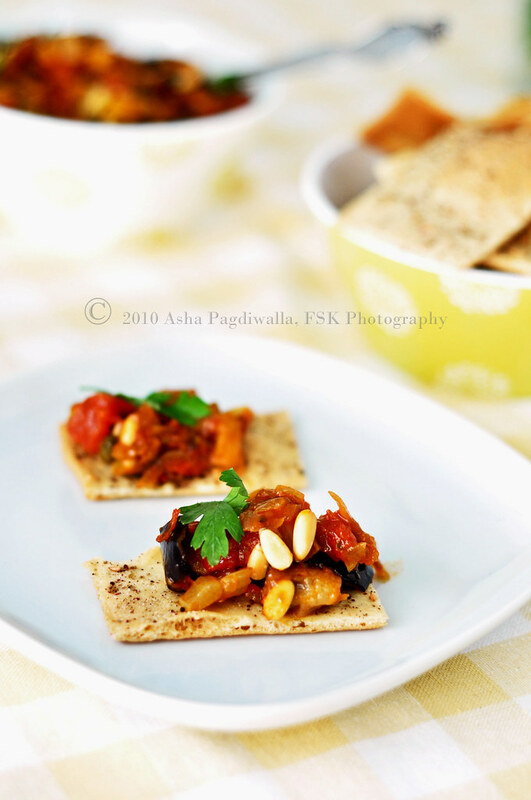 So, today, I present to you a traditional Sicilian Caponata resonant with the flavors of celery, olives, capers and eggplant served on Z'atar Lavash Crackers. Voting for the second challenge opens on 27 september. I very much appreciate your comments and, ofcourse, votes! :). Toss the eggplant with salt and set aside in a strainer to let the bitter juices flow out. Meanwhile, fry the celery in oil until cooked but not soft, about 2 minutes. Remove from oil and reserve. In the same oil, saute onions until soft. Add the pine nuts, capers, olives and saute for a couple of minutes. Add the crushed tomatoes and paste and cook the mixture through. Remove from heat and set aside. Rinse and pat dry the eggplant. Fry in hot oil until golden brown. Add the eggplant to tomato mixture and return to heat. Add the sugar, vinegar and 1 teaspoon of olive oil. Cook until the mixture thickens. Cool and then refrigerate. Serve cold or at room temperature. 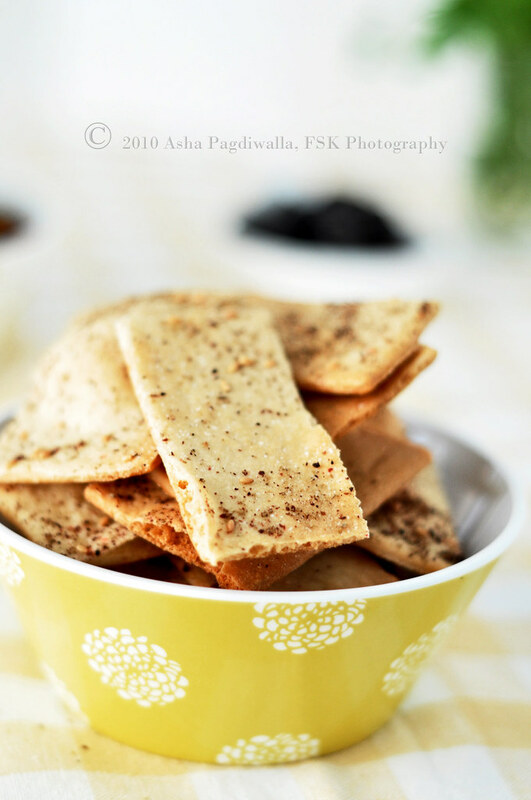 Lavash Crackers recipe is from Food & Wine.